This entry is part 3 of 7 in the series Jonah the Anti-Prophet. Last week, we saw how Jonah wound up running in the opposite direction when God called him to go preach to the city of Nineveh. It’s kind of understandable that he did; the Assyrians weren’t exactly the most loveable of people. Given Jonah’s understanding of God and His grace, he knew how this story was going to turn out and he didn’t want to see the people of Nineveh get the divine retribution they so richly deserved. Hence the running bit. Jonah was going to get away to Tarshish, which probably was in Spain (but no one knows for certain). Jonah goes to the town of Joppa and buys a ticket with a bunch of sailors and then, what can best be described as a voyage into intense irony begins. It starts with a storm. The sailors, completely freaked out at the thought of their ship sinking, do everything they can to lighten the load. They have no idea why this is happening to them, but they’re bound and determined to do whatever it takes to survive. Jonah, though, can’t be bothered. He’s down in the hold sound asleep. Huh. How ironic. These pagan sailors’ first instincts is to call on the divine while Jonah, the actual prophet, wants to keep quiet. The sailors are desperate for their gods to notice their plight. Jonah wants to stay hiding below decks. But it gets better. Rather than ‘fess up to what he did, Jonah remains silent and forces the sailors to cast lots to figure out who’s responsible for their predicament. When he’s cornered and can’t hide it anymore, he tells the whole story. Once again, in an ironic move, the sailors are more in awe of God than Jonah is. They’re horrified at the idea that Jonah has done something to upset “the God of heaven, who made the sea and dry land.” They really want to get on His good side, so they ask Jonah what to do. Jonah’s solution is simple: chuck him overboard. Please, Lord, do not let us die for taking this man’s life. Do not hold us accountable for killing an innocent man, for you, Lord, have done as you pleased. And with that, they toss Jonah into the sea. And the storm immediately stops. The sailors, absolutely amazed at what they’ve experienced, worship God because they’ve realized that he is the real deal. This is the irony of this situation. These sailors, who presumably know very little about God, show Him more respect than God’s own prophet did. They were more willing to show mercy to Jonah than Jonah was to the Ninevites. 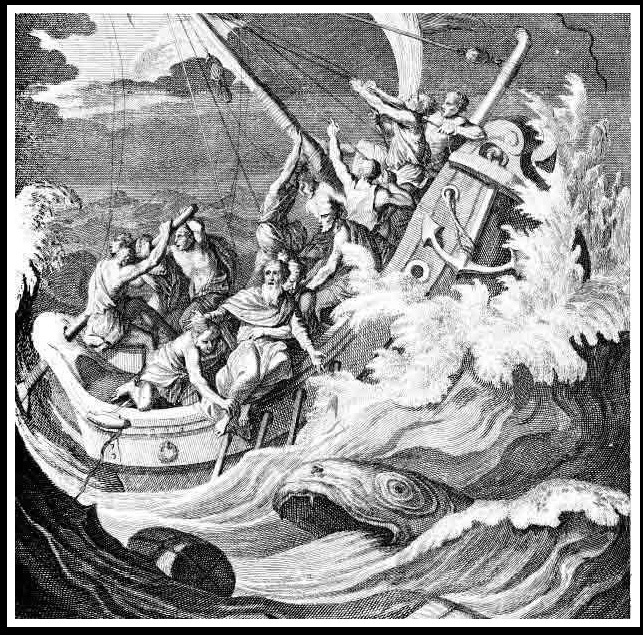 I think the story of Jonah and the sailors is a good reminder to those of us who claim to follow God to live up to the hype. If we say we follow a gracious God, that graciousness should be evident in how we treat each other. If we say we follow a God of justice, then we should be concerned about the injustice we find in the world. And when we fall short of those standards, we take refuge, not in the bottom of a boat, but in God’s own rich grace, knowing that He chases us with His forgiveness. But Jonah’s story isn’t over yet. God has sent the infamous big fish to swallow him and get him back on track. We’ll take a peek at Jonah’s in-the-belly prayer next week.